Outside the US, May 1 is international workers’ day. Unions, immigrant activists and Occupiers are now resurrecting May Day for Americans. Unlike the rest of the world’s democracies, the United States doesn’t use the metric system, doesn’t require employers to provide workers with paid vacations, hasn’t abolished the death penalty, and doesn’t celebrate May Day as an official national holiday. Outside the US, May 1 is international workers’ day, observed with speeches, rallies, and demonstrations. Ironically, this celebration of working-class solidarity originated in the US labor movement in the United States and soon spread around the world, but it never earned official recognition in this country. Since 2006, however, American unions and immigrant rights activists have resurrected May 1 as a day of protest. And this year, in the wake of Occupy Wall Street and the rebirth of a national movement for social justice, a wide spectrum of activist groups will be out in the streets to give voice to the growing crusade for democracy and equality. The original May Day was born of the movement for an eight-hour workday. After the Civil War, unregulated capitalism ran rampant in America. It was the Gilded Age, a time of merger mania, increasing concentration of wealth, and growing political influence by corporate power brokers known as Robber Barons. New technologies made possible new industries, which generated great riches for the fortunate few, but at the expense of workers, many of them immigrants, who worked long hours, under dangerous conditions, for little pay. Within a few years, unions and radical groups around the world had established May Day as an international holiday to commemorate the Haymarket martyrs and continue the struggle for the eight-hour day, workers’ rights and social justice. In the United States, however, the burgeoning Knights of Labor, uneasy with May Day’s connection to anarchists and other radicals, adopted another day to celebrate workers’ rights. In 1887, Oregon was the first state to make Labor Day an official holiday, celebrated in September. Other states soon followed. Unions sponsored parades to celebrate Labor Day, but such one-day festivities didn’t make corporations any more willing to grant workers decent conditions. To make their voices heard, workers had to resort to massive strikes, typically put down with brutal violence by government troops. In 1894, the American Railway Union, led by Eugene Debs, went on strike against the Pullman Palace Car Company to demand lower rents (Pullman was a company town that owned its employees’ homes) and higher pay following huge layoffs and wage cuts. In solidarity with the Pullman workers, railroad workers across the country boycotted the trains with Pullman cars, paralyzing the nation’s economy as well as its mail service. President Grover Cleveland declared the strike a federal crime and called out 12,000 soldiers to break the strike. They crushed the walkout and killed at least two protesters. Six days later, Cleveland—facing worker protests for his repression of the Pullman strikers—signed a bill creating Labor Day as an official national holiday in September. He hoped that giving the working class a day off to celebrate one Monday a year might pacify them. For most of the twentieth century, Labor Day was reserved for festive parades, picnics and speeches sponsored by unions in major cities. But contrary to what President Cleveland had hoped, American workers, their families and allies, found other occasions to mobilize for better working conditions and a more humane society. America witnessed massive strike waves throughout the century, including militant general strikes and occupations in 1919 (including a general strike in Seattle), during the Depression (the 1934 San Francisco general strike, led by the longshoremen’s union; a strike of about 400,000 textile workers that same year; and militant sit-down strikes by autoworkers in Flint, Michigan, women workers at Woolworth’s department stores in New York, aviation workers in Los Angeles and others in 1937) and 1946 (which witnessed the largest strike wave in US history, triggered by pent-up demands following World War II). The feminist, civil rights, environmental and gay rights movements drew important lessons from these labor tactics. Meanwhile, May 1 faded away as a day of protest. From the 1920s through the 1950s, radical groups, including the Communist Party, sought to keep the tradition alive with parades and other events, but the mainstream labor movement and most liberal organizations kept their distance, making May Day an increasingly marginal affair. In 1958, in the midst of the cold war, President Dwight Eisenhower proclaimed May 1 as Loyalty Day. Each subsequent president has issues a similar proclamation, although few Americans know about or celebrate the day. In 2001, unions and immigrant rights groups in Los Angeles resurrected May Day as an occasion for protest. The first few years saw rallies with several hundred participants, but in 2006 the numbers skyrocketed. That year, millions of people in over 100 cities—including more than a million in Los Angeles, 200,000 in New York and 300,000 in Chicago — participated in May Day demonstrations. The huge turnout was catalyzed by a bill, sponsored by Representative James Sensenbrenner Jr. (R-Wisconsin) and passed by the House the previous December, that would have classified as a felon anyone who helped undocumented immigrants enter or remain in the United States. In many cities, the protest, which organizers termed the “Great American Boycott,” triggered walkouts by high school students and shut down businesses that depended on immigrant workers. Since then, immigrant workers and their allies have adopted May Day as an occasion for protest. America is now in the midst of a new Gilded Age with a new group of corporate Robber Barons, many of them operating on a global scale. The top of the income scale has the biggest concentration of income and wealth since 1928. Several decades of corporate-backed assaults on unions have left only 7 percent of private sector employees with union cards. More than half of America’s 15 million union members now work for government (representing 37 percent of all government employees), so business groups and conservative politicians have targeted public sector unions for destruction. The past year’s attacks on teachers, cops, firefighters, human service workers and other public sector workers in Wisconsin, Ohio and elsewhere—the most ferocious anti-union crusade in decades—have catalyzed a tremendous sense of urgency among union workers and millions of other Americans who’ve seen their standard of living plummet while the richest Americans and big business plunder the economy. The Occupy Wall Street movement’s success can be measured in part by how public opinion has changed about such issues as corporate profits, widening inequality and excessive executive compensation. By last December, two months after the first occupations at Zuccotti Park, 77 percent of Americans—and 53 percent of Republicans—agreed that “there is too much power in the hands of a few rich people and corporations,” according to a Pew Research Center survey. The Pew study also found that 61 percent of Americans believe that “the economic system in this country unfairly favors the wealthy” and that 57 percent think that wealthy people don’t pay their fair share of taxes. Most of these people won’t be found protesting in the streets, but the nation’s changing mood clearly influences what candidates for office and elected officials think they need to do to satisfy public opinion. This year, in the wake of Occupy Wall Street, and in the midst of a presidential election contest, activists from around the country are ramping up the May Day festivities. Feeling a new wave of anger and activism among their rank-and-file, unions will be taking to the streets this May Day. In Los Angeles, for example, the County Federation of Labor will augment the downtown immigrant rights rally with a series of protest actions led by different unions and their allies. The Teamsters will sponsor a demonstration at a waste sorting facility owned by American Reclamation, which is infamous for treating its immigrant workers like garbage. The action is part of the Teamsters campaign, in partnership with environmental and community groups, to not only organize workers in recycling plants but also to push the city government to regulate waste collection and recycling. UNITE HERE will bring thousands of hotel workers to Long Beach, where they are organizing several nonunion hotels, to rally and collect signatures for a “living wage” ballot measure. Supported by SEIU, LA’s 8,000 unionized janitors, who will be out in force to demand a better contract from the mega-corporations that own the area’s office buildings, may announce a county-wide strike on May Day. SEIU’s airport workers affiliate will be spending May Day engaged in protest and civil disobedience at Los Angeles International Airport to challenge efforts by major airlines to jeopardize employees health and safety. In April, a coalition of unions, environmental groups, community organizing networks — including National People’s Action, PICO, the Alliance of Californians for Community Empowerment, Jobs with Justice, National Domestic Workers Alliance, Rainforest Action Network, SEIU, United Food and Commercial Workers, AFL-CIO, Communication Workers of America, MoveOn, Unite Here, Common Cause, the Steelworkers union Public Campaign, Public Citizen, Health Care for America Now, the United States Students Association, and others—began a series of protest actions major banks and corporations, and trained close to 100,000 new recruits in civil disobedience tactics. In April they showed up (and some got arrested) at Cigna, General Electric and Wells Fargo shareholder meetings. In the next month, they plan to make their voices heard at Verizon, Bank of America, Hyatt, Tesoro, Sallie Mae, Walmart and other corporate annual meetings. They will commemorate May Day with actions at several corporate headquarters and stockholder meetings as part of this ongoing “99% Spring/99% Power” campaign that will continue throughout the summer and into the election season with demands that corporations pay their fair share of taxes, big banks end the epidemic of foreclosures and reduce “underwater” mortgages to their fair market values, and that banks and Congress unleash college students from unprecedented debt from student loans. By keeping the heat on, and gaining visibility, they hope to inject these issues into the upcoming election season. The Occupy movement will relaunch its protest actions with May Day actions. 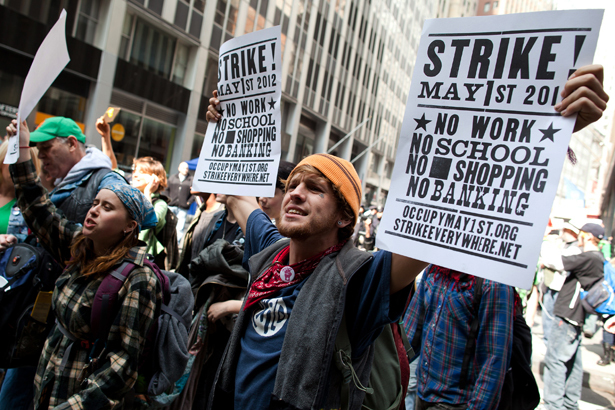 Occupy affiliates in some cities have called for a May Day “general strike” to demand jobs for all, immigrant rights, a moratorium on foreclosures, and recognition of housing, education and health care as human rights. Although talk of a nationwide general strike is certainly premature, many Occupy activists will join with unions and community groups this spring and summer as part of broad mobilizations to take advantage of the nation’s growing “99 percent vs. 1 percent” mood. “It was mostly immigrants who led the first May Day movement for the 8 hour day. Now a new generation of immigrant workers have revitalized and brought May Day back to life,” observed María Elena Durazo, the feisty head of the Los Angeles County Federation of Labor who enthusiastically embraced the Occupy movement in her city. “Progressives around the country, working on all kinds of issues, have embraced the new May Day movement. It isn’t just about immigrant rights. It isn’t just about workers rights on the job or even about raising the standard of living for all workers. It’s about what kind of country we want to be.